I'm not exactly sure if this is a true "Brioche" but it is made much like you would make a brioche, so I'm going with it. This is one of my favorite special occasion breads. It's perfect as a gift, which is what I did with this batch. It was a thank you to the employees of the airport we toured for our first home-school field trip. It's a bit involved but totally worth it. In the bowl of your electric mixer, stir together the milk, 1/2 teaspoon white sugar, and the yeast. Let this mixture stand 5-10 minutes or until the yeast is foamy. Add the flour, the remaining 1/4 cup sugar, and the salt and beat until combined. Add the egg and beat the dough for a few minutes. Using the dough hook gradually add small pieces of the softened butter. Turn out the dough onto a flour surface and knead the butter in until the dough is silky and soft. (The dough will fall apart but come together towards the end). Place the dough in a buttered bowl, cover with plastic wrap or a clean towel, and leave to rise in a warm place until doubled in size (this will take about 1 1/2 - 2 hours). Once it has doubled in size, punch the dough down and, on a lightly floured surface, roll out, then press into a 13 x 9 inch baking sheet. In a small bowl, whisk together the cream, egg and cinnamon for the egg wash. With a pastry brush, lightly brush the surface of the dough with the egg wash. Cover the dough and let rise until doubled in size (about 45 minutes to 1 hour). In a small bowl combine the sugar, flour, and cinnamon. 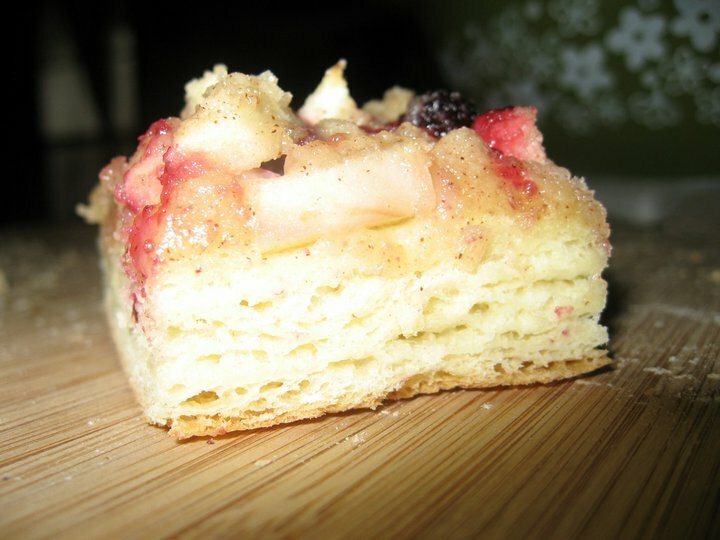 With a pastry blender, cut in the butter until the mixture is lumpy. Set aside. Preheat the oven to 350 degrees. When the dough has doubled in size, once again lightly brush the surface with the egg wash. 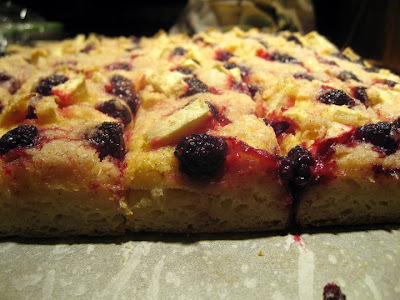 Evenly place the blackberries and diced apple on the dough and then sprinkle with the streusel topping. Bake for about 35 minutes or until nicely browned and cooked through. Cut into squares and enjoy warm! Visiting from A Thrifty Mom. This looks yummy to my tummy! I am for sure going to make this. My mom lives in southern Or. and has wild black berries growing for miles on her 20 acres. Every year I go and pick a years worth of berries and freeze them for wonderful recipes like this. Thanks for sharing!